Nozzle heater elements manufacturers have consistently risen for their huge demand. Meeting the industrial and home needs, Chhaperia presents quality enriched products. Customer satisfaction is our top priority. This has driven us to be a trusted company in the field of electric heater manufacturing. The widely used industrial product, a nozzle heater is designed according to the application. The operating temperatures of nozzle heater range up to 100-degree Fahrenheit and maximum voltage at which the heater can operate is 240V. The typical applications include injection molding machines, extruders, blown film dies, and other cylinder heating elements. 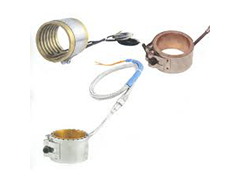 As nozzle heater elements manufacturers, Chhaperia has received fame being in the core of the electrical industry.